Is the following recipe any good? Well, put it this way; it’s so good, that my wife went back for a secret slice and accidentally destroyed my beautiful, sugary creation. It slid off the plate as N was putting it back (with an unnoticable slither missing) and was sadly reduced to a crumpled wreck. It wasn’t intentional, but the fact remains: this is a treacle tart you’ll go back to again and (if it’s still in tact) again. 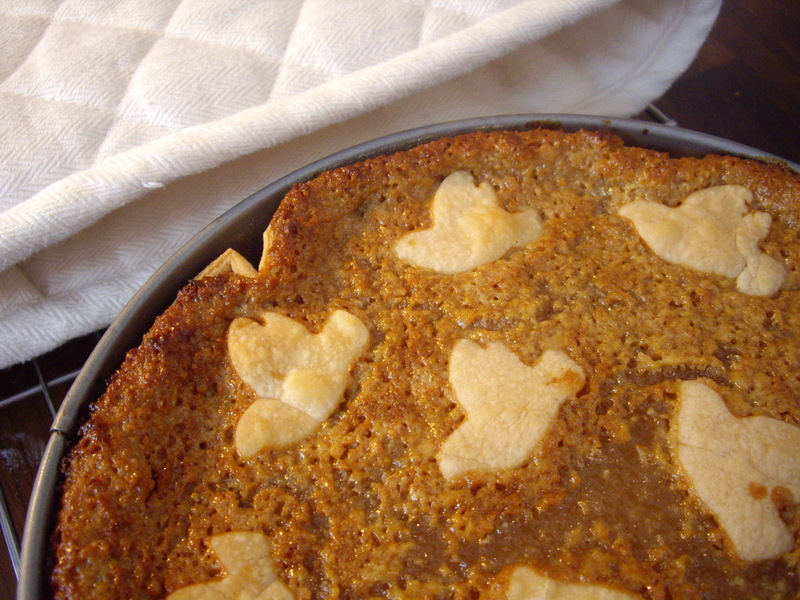 As a child, treacle tart held no appeal for me. It was always served hot (a no-no for Dimitri) and didn’t look particularly exciting. Nothing looks as exciting as chocolate cake. Even the name of this super-sweet pudding seemed strange to me. What on Earth is treacle and why would anyone eat it? As an adult, I’ve spent time discovering the food that I rejected at earlier intervals in my youth. The dishes eaten by my parents and grandparents, the food that was popular before the advent of television chefs and giant supermarkets. My mum is the Queen of Puddings and describes her favourites with delight and a wonderfully descriptive style. 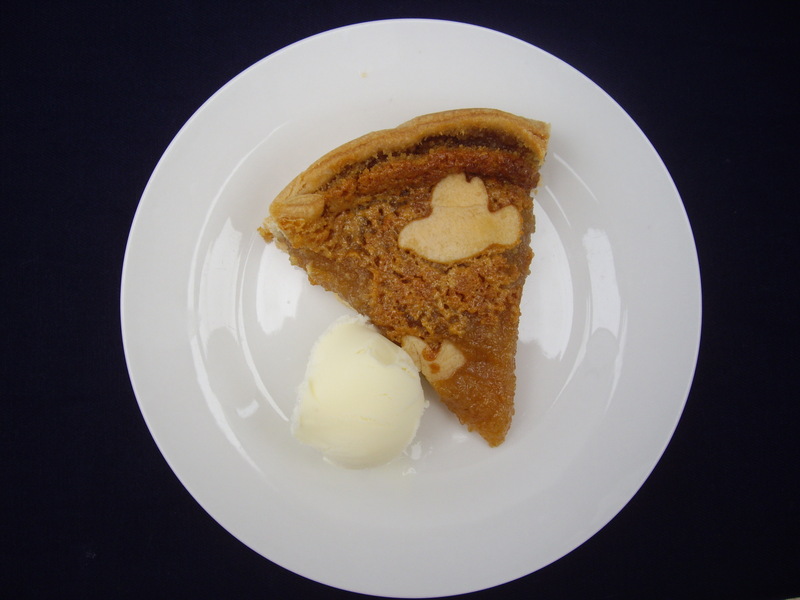 Listening to her describe a good treacle tart is enough to inspire anyone to make this classic pudding. The ingredients are simple, widely available and for me, surprising. For a start, where’s the treacle? Roll out the pastry and use it to line a 20cm cake tin. Trim the edges and prick the base with a fork repeatedly. Put the tin into the fridge for half an hour and set aside the pastry trimmings. Meanwhile, put the breadcrumbs into a medium bowl and pour in the syrup. Add the cream and the vanilla extract and mix well. 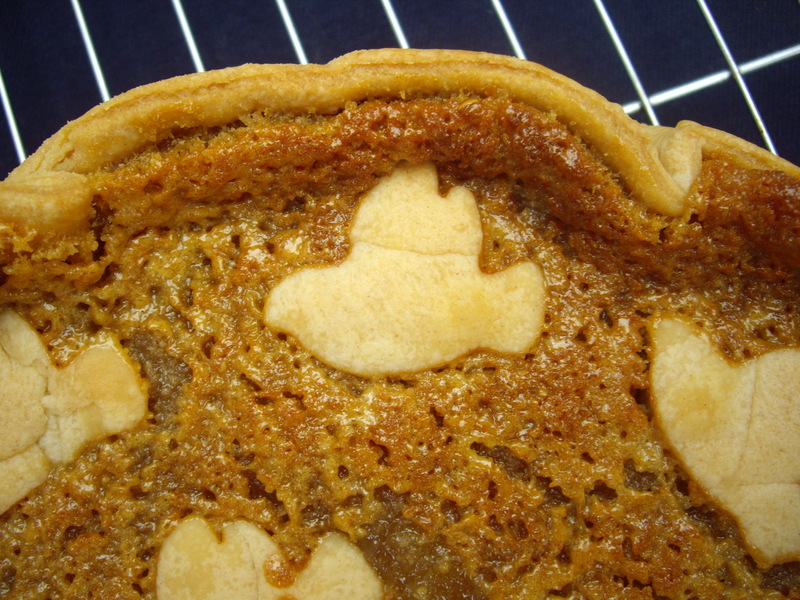 Use the pastry trimmings to make some shapes that you can place on top of the tart before baking. 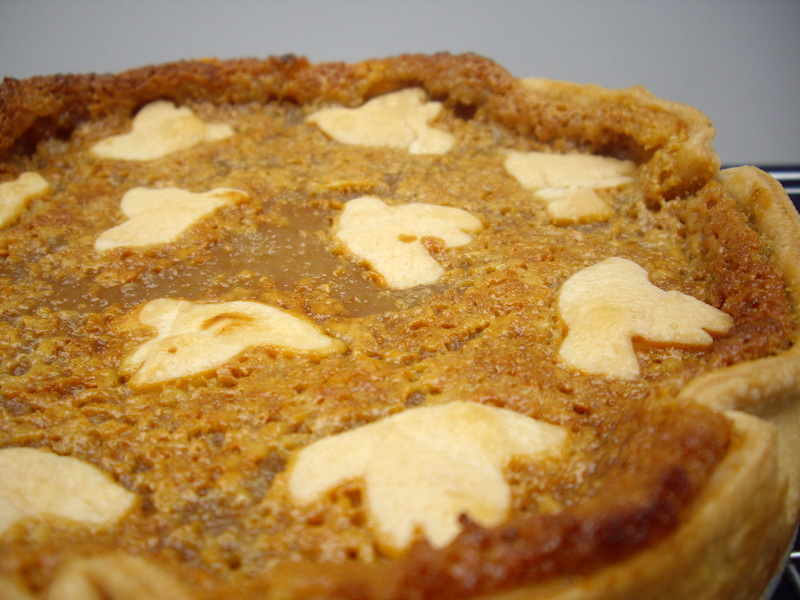 After thirty minutes, take the cake tin out of the fridge, pour the mixture into it and place your pastry shapes on top. Bake on the middle shelf of the oven at 190 degrees Celsius for about thirty-five minutes. The tart will be golden and just set when ready. If you value your tongue, let the tart cool for some time before attempting to taste it. When baking, the tart itself is hotter than the surface of the sun. I like to serve it with ice-cream, but some double cream would be good too. 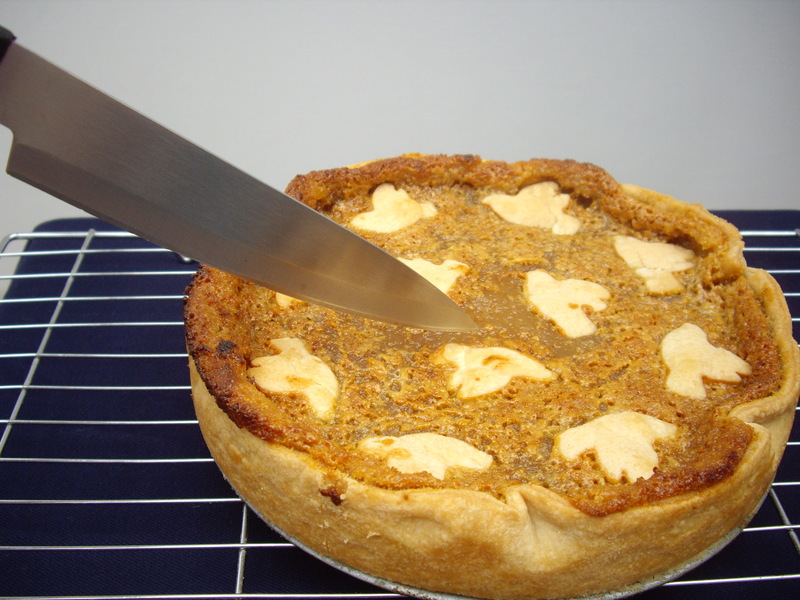 If you decide to get a sneaky slice when nobody is looking, be careful not to let the tart slide off the plate. 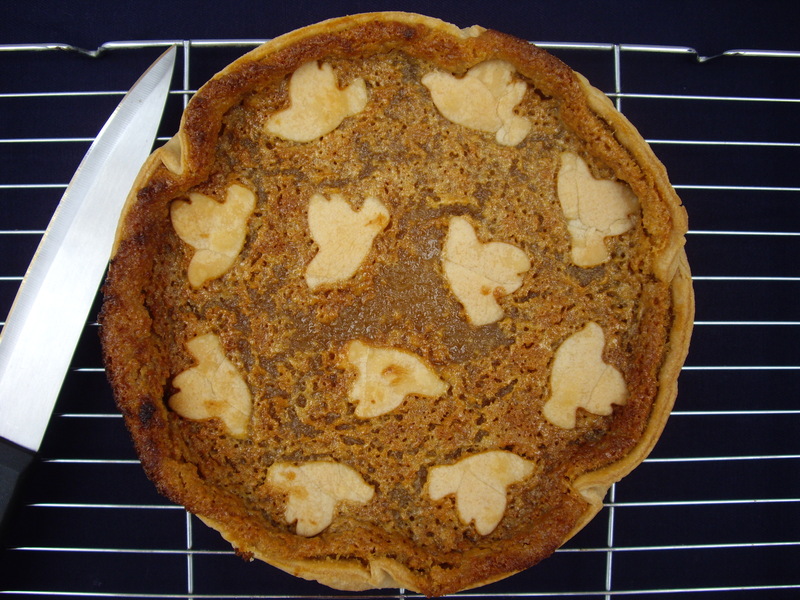 I forgave my lovely wife, but I got the impression that she felt the loss of the tart more deeply than the pang of guilt. I don’t blame her! 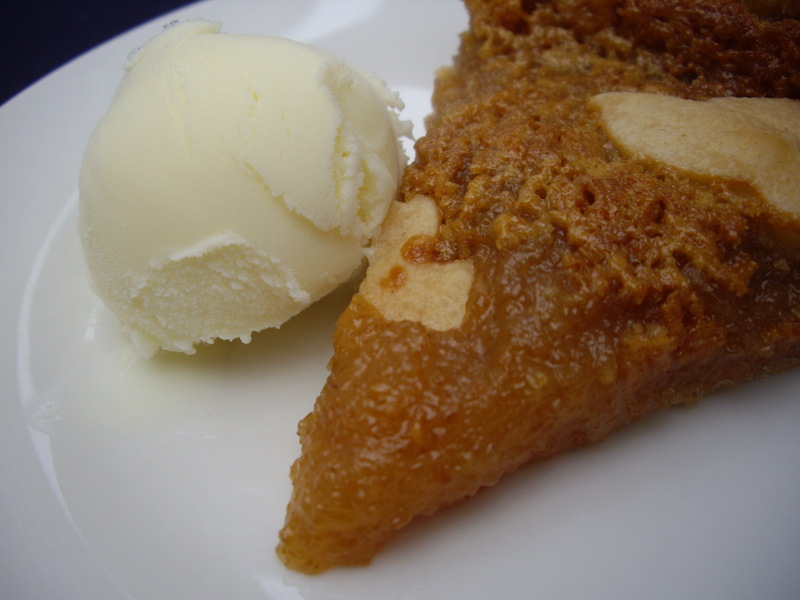 This entry was posted in Perfect treacle tart and tagged dessert, food, ice-cream, Pudding, sugar, syrup, treacle, vanilla by Dimitri @ The Last Piece of Cake. Bookmark the permalink. I have always wanted to try one of these. I don’t know if I can buy the golden syrup here. Is that just corn syrup? Apologize if that was in your blog, I didn’t get to fully read it as I am stll at work..shh.sneaking to read my email! 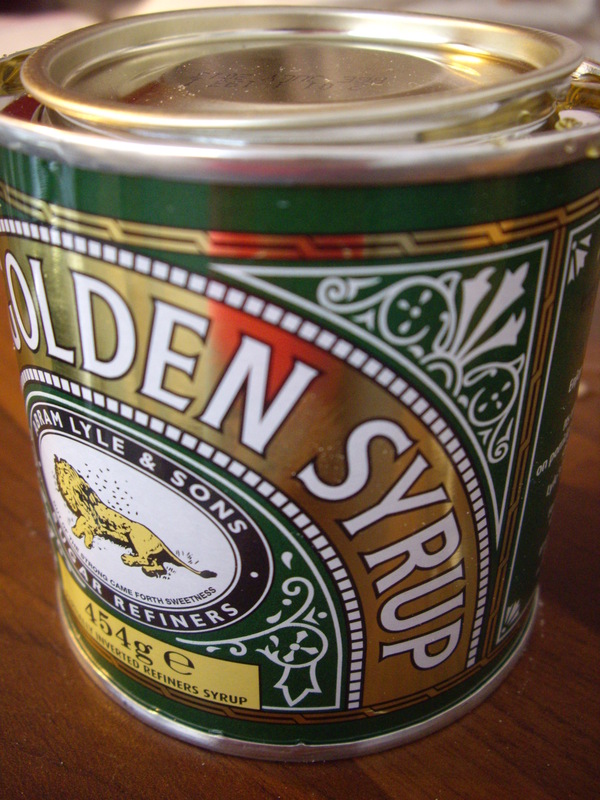 If you can’t get Lyle’s Golden Syrup, you can substitute with King Golden Syrup (which is a mixture of corn syrup and invert syrup). You might be able to find Lyle’s at Cost Plus World Market, but don’t hold me to that. 🙂 Online retailers might be a good bet. Those bird pastry bits on top are so beautiful. Good work! 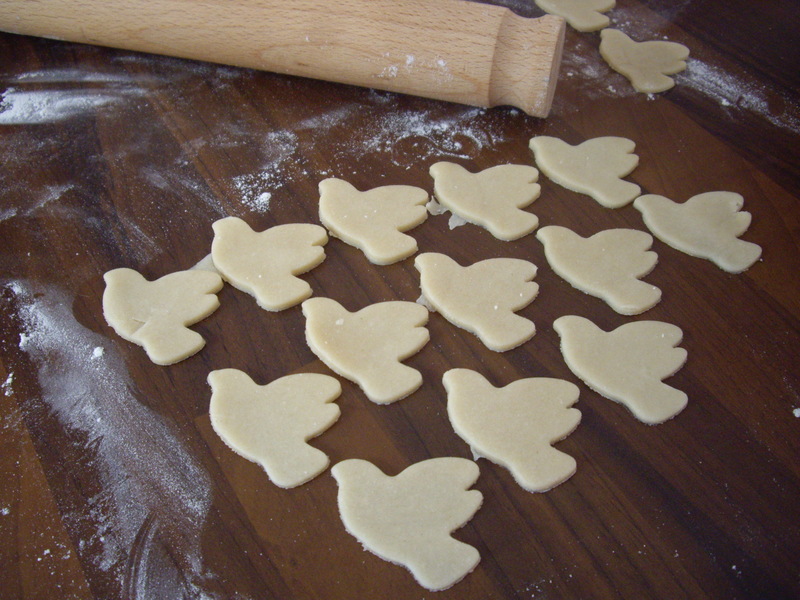 Those pastry birds are absolutely gorgeous.